Containing the Ultimate ingredient Moroccan Argan Oil, this extraordinary formula delivers “A-List” worthy hair without the high price tag, so you're left with plenty of pounds in your purse! 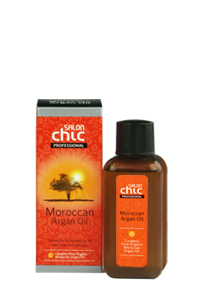 Perfect for all hair types, Salon Chic Professional Moroccan Argan Oil will revive tired locks into soft, smooth and lustrous hair. 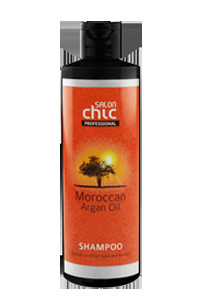 Contains a unique Moroccan Argan Oil formulation which deeply hydrates & nourishes hair, leaving it irresistibly soft, smooth and shiny. Enriched with Moroccan Argan Oil extract, Vitamin B5 and UV filters, this Paraben free formula will help you create incredible shine, hydration and outstanding frizz control for any style. Enriched with Moroccan Argan Oil extract, Natural Betaine and UV filters, this Paraben free formula will help you create incredible shine, hydration and outstanding frizz control for any style. 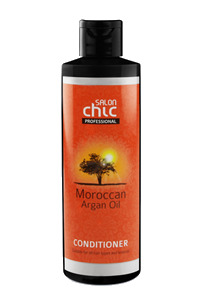 Contains a unique Moroccan Argan Oil formulation that prepares the hair for blow drying, straightening or curling. Enriched with Moroccan Argan Oil extract and Vitamin B5, this Paraben free formula will help you create incredible shine and hydration with a heat protected smooth finish. 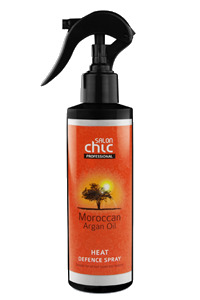 Believed to be one of the rarest oils in the world, Argan oil had long been Morocco’s best kept secret. This revolutionary Salon Chic Argan Oil will give hair a silky quality by renewing & moisturising each hair cuticle, making each strand reflect light & reduce frizz.